Some day a hard rain's gonna fall on these streets. An affinity for the magical elements make Ororo Munroe the mistress of weather manipulation, Storm. The figure is a mix of new and old. She gets the "jeans" legs with new pieces slipped over the shins to create her high boots, and her torso is new: the chest looks like it's the same mold as Typhoid Mary's (but it isn't), and her shirt rides up slightly to show a bit of belly. She gets the "gesturing" hands with flares on the wrists to suggest her gloves, and her vest and crossed belts are new, separate pieces as well. You may have expected this figure would use the existing head from Series 1, but surprise, she doesn't! You can tell because 1) the mohawk is shorter, 2) she's wearing lightning bolt earrings, and 3) she's got a saucy smirk tugging at the corner of her mouth. Her eyes are blank, because how else would we know she's using her mighty mutant powers? 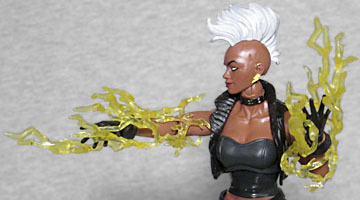 To show that Storm is using her powers, the figure comes with two lightning bolts that can wrap around her arms. They're the Thor pieces again, but they make a ton more sense here than they did for Magneto, even if something sized for Chris Hemsworth's meaty biceps ends up way too large on Storm's more slender arms. They're molded from translucent yellow plastic. 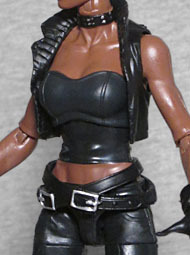 Naturally, Storm also comes with a part of this series' Build-A-Figure. The BAF is Apocalypse, and her piece is the entire frigging torso. Big time! 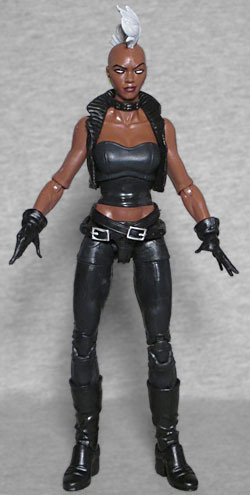 This version of Storm has had figures from Marvel Universe and Marvel Minimates, but never Marvel Legends - though they've come close before, it's nice to finally get the real thing.